Valmet introduces a new ATEX certified tracking solution integrated into the Valmet DNA automation system for LNG, gas and chemical containers. The ATEX Directive 2014/34/EU covers equipment and protective systems intended for use in potentially explosive atmospheres. Better container management through centralized data management is a valuable tool in improving safety and protecting the environment in ports. The new tracking solution complements the Valmet DNA Integrated Operations application launched in February 2018. This Industrial Internet solution was developed in cooperation with Yepzon, a location device and service provider. The latest 5G technologies for the solution will be supplied by Qualcomm. "The new solution utilizes Valmet's and Yepzon's latest technologies by integrating data from different processes with GPS tracking and other information from a tracking device. An easily traceable identity will be created for each container, and container location and status can be monitored online. Together with the Valmet DNA Integrated Operations solution, the device enables, for example, loading operations at terminals without expensive local systems," says Jani Hautaluoma, Director, Process Automation, Valmet. 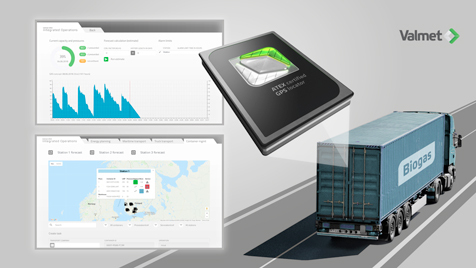 The new ATEX certified 5G tracking solution will be part of Valmet's service offering for container and data management linked with the Valmet DNA automation system. It provides the user with a continuous flow of accurate real-time location data and other sensor data, for example, about collision, temperature and air humidity. Its predictive features bring significant added value for logistics planning. In addition to cost benefits, the solution improves haulage protection and safety. The solution has been developed on the basis of Valmet and Yepzon's successful pilot project that showed a need for developing tracking solutions. To date, the industries have used traditional techniques such as RFID (radio frequency identification). "This project developed together with Valmet creates a solid basis for expanding Yepzon's services even further for the oil and gas markets and other industries," says Otto Linna, Founder of Yepzon. Valmet is the leading global developer and supplier of process technologies, automation and services for the pulp, paper and energy industries. We aim to become the global champion in serving our customers. Valmet's strong technology offering includes pulp mills, tissue, board and paper production lines, as well as power plants for bioenergy production. Our advanced services and automation solutions improve the reliability and performance of our customers' processes and enhance the effective utilization of raw materials and energy. Valmet's net sales in 2017 were approximately EUR 3.1 billion. Our more than 12,000 professionals around the world work close to our customers and are committed to moving our customers' performance forward - every day. Valmet's head office is in Espoo, Finland and its shares are listed on the Nasdaq Helsinki. A new Industrial Internet tracking solution integrated into the Valmet DNA automation system for LNG, gas and chemical containers improves container management, improves safety and protects the environment in ports.